Hearn, S. A New Deal is needed for youth. GREAT Insights Magazine, Volume 6, Issue 1. February/March 2017. The New Deal is a set of partnership principles for ending conflict and poverty. Agreed by the g7+ group of fragile and conflict-affected countries, it commits them to goals for inclusive politics, security, justice, laying the foundations for economic growth, and collecting revenues to provide services. These peacebuilding and statebuilding goals are intended to address the root causes of conflict and constitute the foundations for long-term development. The “deal” part of the equation hinges on compacts that bind together government, society and international partners towards the collective pursuit of these common goals, and mutual accountability for progress. In 2016, I reviewed the New Deal and the progress it has made so far. Suffice it to say: simply signing up to the New Deal is not the panacea. Since its launch in 2011, the New Deal has been criticised for being too technical, for low uptake among national political leaders and international partners, and for not sufficiently involving society. But the New Deal principles remain essential for advancing the UN Sustainable Development Goals (SDGs). One billion people could escape extreme poverty by 2030 if countries can resolve conflict and crisis, and build inclusive, accountable and effective enough institutions. But this foundational work for development must be well underway by 2020 if countries are to achieve the SDGs by 2030. This is one of the reasons that all countries agreed SDG 16, which commits to building peaceful and inclusive societies, institutions and access to justice, as well as SDGs for jobs, equality and education, which help to address the causes of instability. Youth have frequently been overlooked in New Deal processes. Yet many of the key risks of instability and conflict involve youth. The Middle East is a cautionary tale, where the UN has warned of a second Arab uprising driven by continued youth unemployment and exclusion. A growing youth population in Sub-Saharan Africa and fragile countries in Asia could drive rapid development gains if enough jobs can be created. But a burgeoning youth population could also challenge the legitimacy of states with limited capacity to attract investment and jobs and provide education. Rapid population growth is also likely to be accompanied by rapid urbanisation, but countries that previously experienced conflict also frequently experience more urban criminal violence. Violent criminal groups that probe countries looking to exploit youth grievances, weak institutions and porous borders could compound these factors in a growing number of g7+ countries, as they have in the Sahel, Horn of Africa, Middle East and Latin America. To counter this, above all, political leaders in the g7+ countries need to recommit to the principles of the New Deal, and especially to political processes that bind all relevant actors into a shared vision for what needs to happen and how to resolve the causes of conflict, build peace and achieve the SDGs. These processes need to include parliaments, the private sector, media and citizens groups, including youth. They can be pursued at the national and subnational levels to address national and urban drivers of violence and instability. 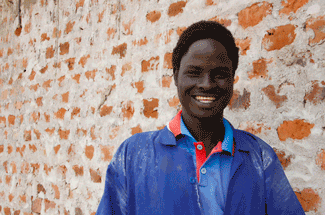 In conducive political conditions, finding innovative ways to empower youth will also be key. 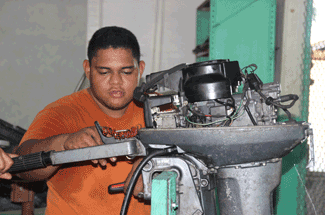 The private sector creates 90% of jobs in developing countries. The g7+ has recognised that jobs are essential for sustaining peace and identified key priorities for: job creation through public works, focusing on the groups that have the highest potential to drive conflict; creating stability and an enabling environment for the private sector; and support for small- and medium-sized enterprises. However, the international community could go further than it has to assist the g7+ in job creation and training. Fragile countries receive just 6% of total foreign direct investment in all developing countries. Aid modalities that attract private investment are under-utilised in fragile states, despite the fact that this is where they are needed most. These include publicly-backed risk guarantees and equity investment shares that help countries mobilise private investment and job creation in key sectors. The private sector, for its part, needs to be at the table to design and co-finance initiatives aimed at giving youth sufficient opportunities. Building community resilience is the other side of the equation for building self-reliance and livelihoods. At the Addis Ababa International Conference on Financing for Development in 2015, countries agreed to spend US$300 per capita on social protection; however, the gap between this ambition and affordability in g7+ countries is vast. Meeting the social protection target would cost countries the equivalent of 44% of GDP in the Democratic Republic of Congo, 25% in Guinea, and 32% in Central African Republic. Economic growth and raising domestic revenues will be crucial in the long-term, but with no new international aid commitments on the table now, making the best use of all available aid sources to build resilience will be key in the near term. The UN has proposed solutions to pool humanitarian, development and peacebuilding finances into social protection, education, and livelihoods programmes that build communities’ self-reliance. Europe’s refugee crisis has focused aid partners’ attention on job creation and resilience in fragile states to curb migration flows. The UK’s post-Brexit bilateral aid review, for example, commits to creating employment in countries that are sources of refugees and migrants. However, every country’s individual response to crisis in the Middle East is leading to an overall decline in investment in least developed countries (LDCs). For the first time in over a decade, rich countries’ aid spending on the LDCs dropped by 5% in 2015. g7+ countries, such as Sierra Leone, are now underfunded. In the long-term, this trend may be irrational. The international community could find itself forever throwing money at the latest crisis unless it invests in long-term partnerships with the poorest and most fragile countries in the first place. This is why it is crucial for all partners to redouble political commitment to the New Deal principles. It is more important than ever for g7+ political leaders to pull together ministries, civil society, the private sector and international partners to jointly identify and resolve the causes of conflict and crisis by pursuing a next generation of development programmes that empower booming youth populations. This article builds on Hearn, S. (2016), Independent Review of the New Deal for Engagement in Fragile States. Sarah Hearn is a scholar at New York University. 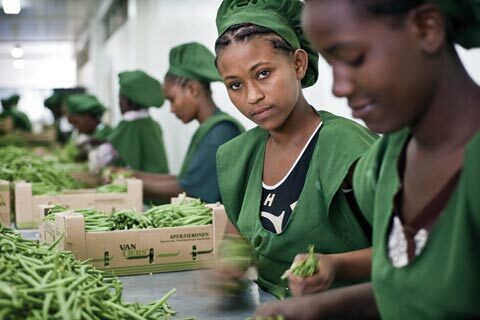 Photo: Bean packing enterprise in Ethiopia: Although more African countries have been registering stronger economic growth, poverty remains persistent. Credits: Panos/Sven Torfinn.